The Great Thrushes (Turdus fuscater) occur naturally in the South American countries of n Bolivia, Colombia, Ecuador, Peru and Venezuela; where they mostly inhabit subtropical or tropical moist montane forests, high-altitude shrubland, and heavily degraded former forests. Range: Eastern Andes of Venezuela and Colombia. Range: Sierra Nevada de Santa Marta, in northern Colombia. Range: Perijá Mountains on the northeastern Colombia-western Venezuela border. Range: Southern and western Colombia and northern Ecuador. Range: Southern Ecuador south to central Peru. Great Thrushes were named for their large size. 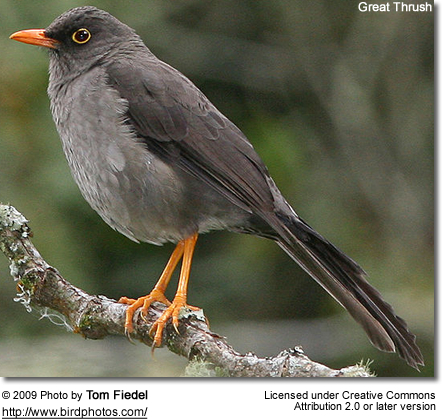 At 12 - 14 inches (30 - 35 cm), they are the largest thrush in the Americas. The plumage is uniform slaty-colored. Great Thrushes mostly feed on insects and berries found on the forest floor or in trees and shrubs. Their cup nests are constructed of plant matter and placed relatively low in trees.